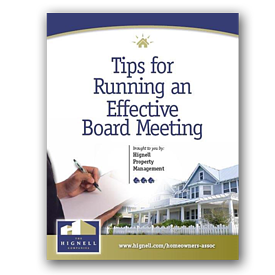 Download your "Tips for Running an Effective HOA Board Meeting"
Want to get things done and stop spinning in circles? Use these tips to improve your Board Meetings. Following these tips and making a few changes, can make a big difference in the amount of time and energy spent in your meetings.